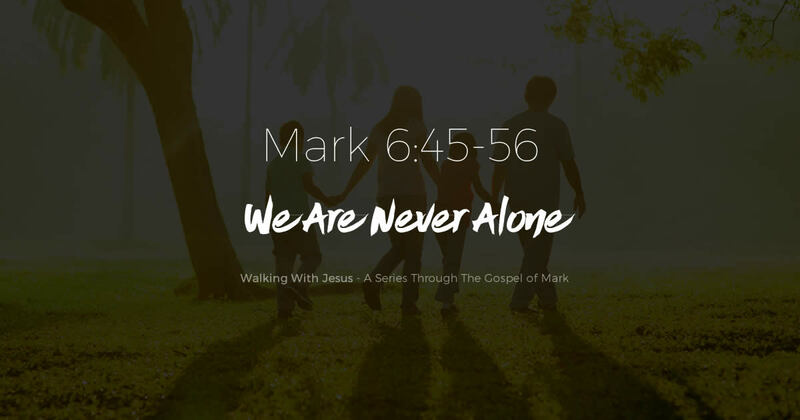 In this passage we read about how the Jesus had to disperse the multitudes after feeding the 5000, how the apostles struggled in the boat as they strained against the wind to get where Jesus told them to go, and then how Jesus appeared walking on the water revealing His presence when they thought they were all alone. 45 Immediately He made His disciples get into the boat and go before Him to the other side, to Bethsaida, while He sent the multitude away. 46 And when He had sent them away, He departed to the mountain to pray. 47 Now when evening came, the boat was in the middle of the sea; and He was alone on the land. 48 Then He saw them straining at rowing, for the wind was against them. Now about the fourth watch of the night He came to them, walking on the sea, and would have passed them by. 49 And when they saw Him walking on the sea, they supposed it was a ghost, and cried out; 50 for they all saw Him and were troubled. But immediately He talked with them and said to them, "Be of good cheer! It is I; do not be afraid." 51 Then He went up into the boat to them, and the wind ceased. And they were greatly amazed in themselves beyond measure, and marveled. 52 For they had not understood about the loaves, because their heart was hardened. 53 When they had crossed over, they came to the land of Gennesaret and anchored there. 54 And when they came out of the boat, immediately the people recognized Him, 55 ran through that whole surrounding region, and began to carry about on beds those who were sick to wherever they heard He was. 56 Wherever He entered into villages, cities, or in the country, they laid the sick in the marketplaces, and begged Him that they might just touch the hem of His garment. And as many as touched Him were made well.